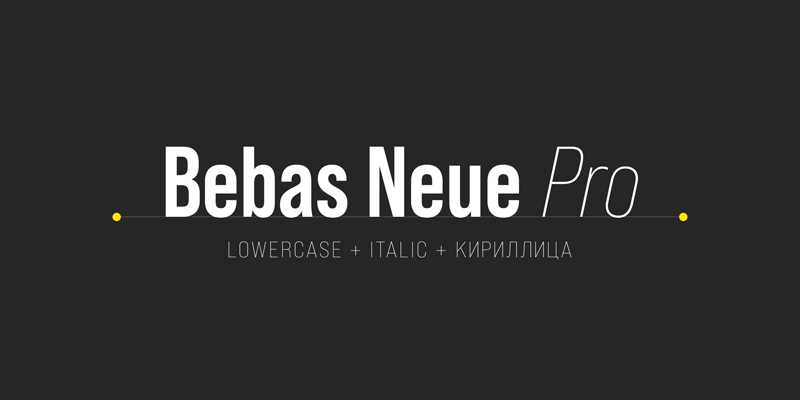 Bebas Neue Pro with lowercases and Italics! I am glad that Bebas Neue grew up very popular in about 10 years. Bebas Neue has been downloaded over 10,000,000 times. Including other site, it is more than 50M! The happiest time is when I hear that you like this font and you are satisfied with this, And when I happen to see actual uses in my life. I hope Bebas Neue saved the life of someone who downloaded until now and will do tomorrow too. This Bebas Neue is free font. You can use this font for commercial purpose for free. When you need to double-check, please send email to info@dharmatype.com. Often time, I miss comments on this page and private messages. Thanks to your donations, I am able to continue free font project. You can donate from top-right 'Donate to author' link.